Sometimes people just want to be around the people they love. We understand. That's why we cater to private trips on existing departures and create custom adventures for small and large groups. ROW Adventures' hallmark is providing high quality guest service where ever we might be in the world. We're masters at creating unique trips for special occasions, and custom adventure travel, both here in the US and across the world. Since 1979, we have offered tailored trips to groups of all types from family reunions to bachelor parties, clubs to church and youth groups and even custom adventures for private parties of two or more. Private Trips <-- Go Here to See How We Make it Easy! Whether you want to charter a yacht in Croatia, raft through Hells Canyon on the Snake River or hike the Inca Trail to Machu Picchu we at ROW Adventures can make this happen, just let us know what you are dreaming and we will put together an itinerary that will make that dream a reality. With 30 years of experience in creating adventures in the USA, South America and Europe we guarantee we can create the trip of a lifetime! Create some outdoor fun on an family reunion trip everyone in your family will enjoy - from those age five to 85. These might be wilderness river trips or lodge-based adventures at the River Dance Lodge. For those looking for adventures further afield these might be a European Barge , a Yacht Trip, a multi-sport trip to Ecuador the, Galapagos or Brazil or a trip to a Jungle Lodge deep in the Amazon. Whether it's a bunch of your old high school buddies, girlfriends getting away from the men in their lives, men wanting to drum and hold hands, whatever the focus, we'll be there to guide, lead, cook, clean, and provide a seamless adventure in nature's backdrop. From schools to clubs to singles groups, GBLT to special interest groups, an outdoor adventure is a wonderful way to bring your group together in a healthy and fun environment. Yale and Harvard Universities have both joined ROW trips as part of their alumni travel program and museum groups, bird watching and wine tasting clubs, conservation groups and many others have benefited from our expertise. We love to customize trips for unique types of groups, so just call us to discuss your specific requests. There's no better place than a wild river canyon or developing country to teach young people solid values and learn a greater appreciation for their place in the universe. Let us work with your program to design a special set of activities which will help you reach your objectives while taking care of all the logistical details and allowing your group the maximum time for relaxing and pursuing your program objectives. 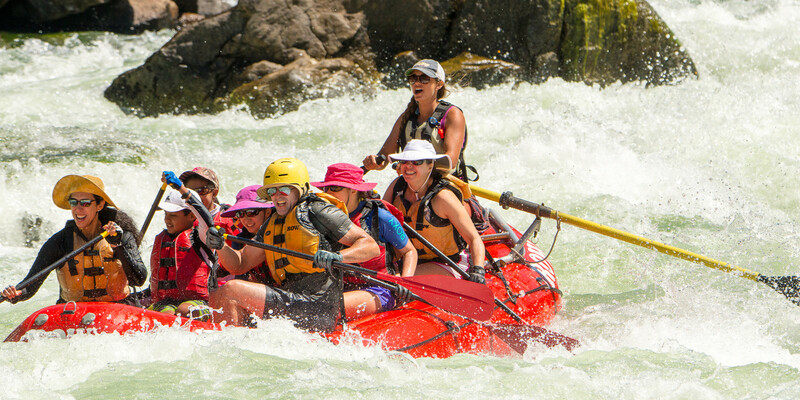 Structure an adventure in Idaho around your company's culture. We'll design an itinerary that provides the time you need for meetings and presentations, while also having plenty of time for fun and bonding. Whether your budget is moderate, or you want to bring on the Ritz, we can do it. Call us at 1-800-451-6034 to book your custom or group adventure today.